on the woodside. : *stir-fry beef and broccoli. I have what amounts to a love-hate relationship with leftovers: My brain loves that they're cost-effective and ideal for lazy people; my heart thinks they are boring boring boring (and don't taste that great). Even though I can admit that there are even some dishes that do manage to taste good the next day or cold—pizza, these wraps—I simply don't have the taste bud attention span to want That Same Thing for my next meal. All of that, combined with my distaste for eating out of styrofoam containers (boo! all the food just steams in there! also the environment! probably in that order ... ), means that I don't eat takeout very often. So far I've made the meal, eaten it, gone back for seconds, and twice (!) partaken of the leftovers. Two separate times! It's a leftover miracle. 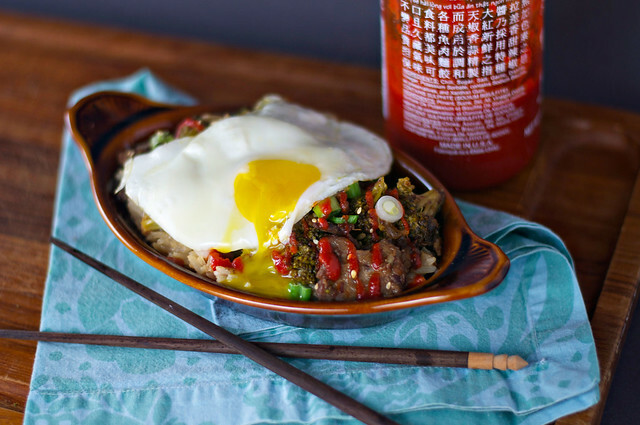 Even if once I slathered it in sriracha and draped a fried egg over it because That Is How I Do. Although let's be serious—can you blame me? A little leftovers note here: If you're going to go this route, put a couple of tablespoons of water in the pan with the rice and reheat it gently on the stovetop. Place the beef and broccoli in a dry skillet and kind of angrily crank up the heat—you want that hoisin to remember to redevelop a caramelized crust on the beef. And please, for the love of all things that taste good, don't put it in the microwave unless you absolutely have to. Microwaves were invented by people who thought flavor was an evil that had to be eradicated. I'm convinced it's half the reason frozen foods have so much salt in them—compensatory sodium! I love the addition of the prepared Chinese hot mustard. (My grocery store sells this one.) I think it and the fish sauce really elevate this beyond the sweeter or blander versions you may have tried before. The mustard has something of a nasal, horseradish-style heat, so feel free to lather it all up with sriracha or chile flakes if you need a more focused kick to the tongue. Simple, satisfying, and styrofoam-free—so much better than takeout. 1. Cut flank steak in half lengthwise; cut each half crosswise into very thin slices. Toss steak with salt, pepper, and just enough cornstarch to coat. 2. Heat canola oil in a skillet over medium-high heat until very hot. Add beef, in batches, and sauté 5 minutes or until edges are deeply browned. Place in a bowl and toss with hoisin; set aside. 3. Add onion to skillet, and cook 3 to 4 minutes or until softened and lightly browned; add ginger and garlic, and cook 1 more minute. Stir in beef broth, scraping to remove browned bits from bottom of pan. Stir in fish sauce and next 3 ingredients. 4. Reduce heat to medium-low, and add broccoli florets. Cover and cook 10 minutes. Stir in beef; cover and cook 10 more minutes or until broccoli is tender and beef is heated through. Serve over rice; garnish, if desired. Makes 6 servings.